Ever wonder what’s inside a ski? How to care for your ski chair? Well, just like you care for your skis! Don’t be fooled by anyone who tells you a ski or anything made from a ski can withstand the elements year-round without signs of weather. A ski is a finely crafted instrument in itself, let alone a chair made from skis. Each ski is comprised of layers of wood, metal and composites, and alternating baking sun and freezing temperatures can cause microscopic cracks to form within the ski. When water enters these cracks and freezes, the ice expansion causes layers within the ski to slowly pop apart (delaminate.) Sun can also fade colors and yellow whites, despite the protective UV coating we apply to each ski. So treat your chair as you would your favorite pair of skis, and you’ll enjoy years of pleasure from both! Do you do anything to the skis before making them into a chair? One of the first steps in making a chair is meticulously cleaning and restoring each ski. This process is actually the most labor-intensive part of chair building! We have our own unique secret “recipe” for success, but we’ll tell you that we might as well buy stock in Fantastik® and Goo Gone® as they work wonders! 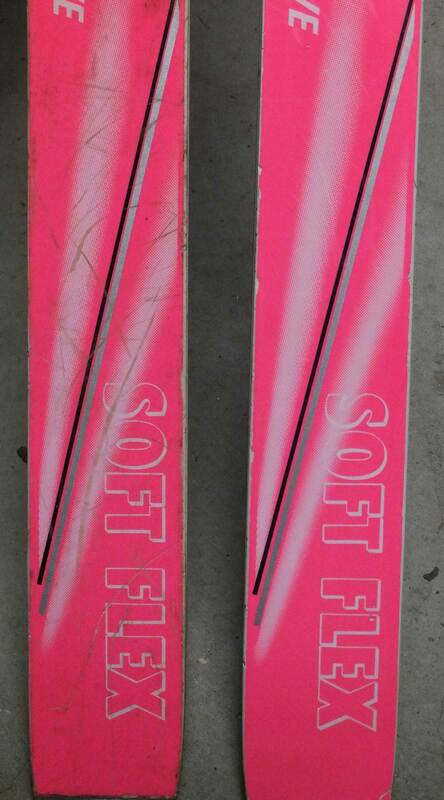 Here is a cleaned/uncleaned picture of one set of skis. Buffing metal edges is a huge part of the restoration process. Here’s a before/after picture. Some skis have several sets of holes in them from bindings. Those holes are filled and colored to match the ski. Lastly, a coat of clear protective finish is applied to help preserve the restored color and shine. How long does it take to make a chair? A-whole-lotta hours! This ain’t Walmart 😉 But as long as you give us two weeks, we can have a custom made chair for you. If you need it in a less than two weeks, it’ll be tricky but we aim to please so give us a shout! Can I have my own skis made into a chair? Sure! We’re sentimental at heart, so we can relate. Nothing better than being able to keep your skiing memories alive in your very own custom chair. If you’re close by, you can drop the skis off, or you can ship them to us. If you need help getting the bindings off, just let us know.